SUMMARY: Histologically identified intracellular and extracellular inclusions and structures often provide a tissue diagnosis of a specific disease process. Moreover, these deposits may provide clues about the pathogenesis of the disease in which they are found. Two distinctive structures seen within the brains of patients clinically diagnosed with dementia of the Alzheimer type are extracellular plaques and intracellular neurofibrillary tangles. The purpose of this report is to review the significance of plaques and neurofibrillary tangles in the context of Alzheimer disease. Histologically identified cellular deposits often provide a tissue diagnosis as well as clues about the pathogenesis of the disease that they represent. Two distinctive structures seen within brains of patients with dementia of the Alzheimer type (DAT) are plaques and tangles. 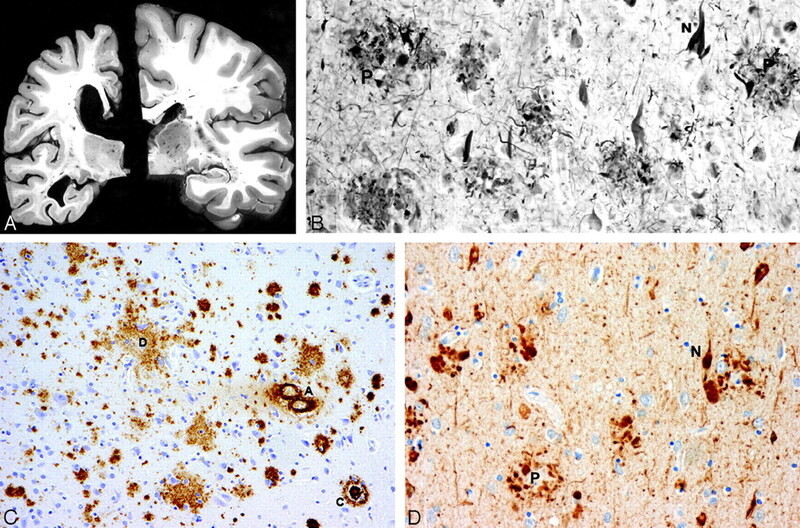 Appreciation of these tissue inclusions enhances the interactions of the neuroradiologist with the neuropathologist, neurologist, geriatric psychiatrist, and geriatrician and deepens the understanding of Alzheimer disease (AD), the all-too-common neurodegenerative disorder. Moreover, neuroradiologists are likely to play important roles in the future regarding the detection and differential diagnosis of AD, given the increasing prevalence of DAT in the aging population and promising research aided by such tools as positron-emission tomography (PET), quantitative structural imaging, molecular imaging, diffusion tensor imaging, and functional MR imaging. The purpose of this report is to review the significance of plaques and tangles in AD. In November 1901, a 51-year-old woman living in Frankfort, Germany, experienced increasing confusion, paranoia, and delusions and was admitted to the local asylum. There she was examined by the young psychiatrist Alois Alzheimer (1864–1915).1–3 Auguste D., as she was named in various reports, was fascinating in that her obvious dementia and complicating psychosis occurred at a much earlier age than the often-observed dementia of the elderly and that her deterioration progressed relatively rapidly.4 Following her hospitalization, Alzheimer left Frankfurt to join the famed pioneer of psychiatric taxonomy, Emil Wilhelm Magnus George Kraepelin (1856–1926), at the Psychiatry Department of Heidelberg University. Both physicians subsequently moved to Munich, where Kraepelin assumed the chair of Psychiatry at the Ludwig-Maximilians-Universität and built an internationally recognized program noted for the groundbreaking concept of biologic causation and neuropathologic correlation of disease presenting as psychiatric illness.5,6 When Auguste D. died in 1906, her brain was sent to Alzheimer in Munich for dissection at his request. He would present his findings at the 37th annual meeting of Southwest German psychiatrists in Tübingen, Germany, in November of that year, and would publish the account in 1907.7 His terse but extraordinarily prescient observations would launch a century of investigation into the causes of this early-onset dementia. In that report, Alzheimer described miliary foci of extracellular structures, which would later be known as “plaques” as well as previously unrecognized intracellular flame-shaped fiberlike bundles that would be named “tangles.”7,8 Alzheimer was a fastidious observer and excellent microscopist, and his descriptions are still regarded as highly accurate. Alzheimer's student and colleague, Gaetano Perusini (1879–1915), would later compile 4 cases, including Alzheimer's original patient, and would more fully outline the clinical and pathologic findings.9,10 By 1910, Alzheimer had extensively studied the 3-year downhill course of a second patient, Johann F., a 56-year-old day laborer. Notably, this patient did not demonstrate tangles.1,11,12 Convinced that the early onset distinguished these patients, Kraepelin honored his protégé by naming the presenile dementing disorder “Alzheimer disease” in the eighth edition of his then-standard psychiatry textbook.5,13–16 Alzheimer's contribution to knowledge about presenile dementia resides in his identification of the clinical and pathologic features of the disorder, which, in turn, contributed to the recognition that dementia was an illness rather than an expected phenomenon of aging. Refinement of pathologic techniques some decades later would rekindle interest in this disorder. A, Atrophy of the brain. On the left, a section of the hemibrain of a 70-year-old patient with AD and, on the right, a healthy aged control brain. The AD brain shows marked atrophy, dilation of the lateral ventricle, and a small hippocampus. B, Neurofibrillary tangles (N) and neuritic plaques (P) in the hippocampus. Modified Bielschowsky silver impregnation. C, β-amyloidosis in the frontal lobe: a diffuse plaque (D), a cored plaque (C), and cerebral amyloid angiopathy (A). β-amyloid (10D5) immunohistochemistry. D, Neurofibrillary tangles (N) and neuritic plaques (P) in the frontal lobe. Phosphorylated ô immunohistochemistry. Several types of plaques have been described. Diffuse plaques are focal poorly marginated collections of aggregated Aβ peptide that are not fibrillar and that lack dystrophic neurites, glial reaction, or any organized internal architecture.18,36 Neuritic plaques contain an attenuated central core of fibrillar Aβ peptide and have neighboring dystrophic neurites.18,24,37 They are associated with the degeneration observed at the synaptic junction and are surrounded by reactive astrocytes and activated microglial cells.24,37 Neuritic plaques also frequently are associated complement factors and immunoglobulins and a surrounding halo that includes fiberlike structures.37,38 Finally, so-called burnt-out plaques represent an end stage process and feature a condensed amyloid core without associated neurites.24 Some investigators contend that the stages of plaque development and resultant neuronal damage begin with the formation of the diffuse plaque, which then advances to the neuritic variety and eventually concludes with the burnt-out type.24,39 There is, however, no direct evidence that an evolution of plaque formation occurs. Aβ plaques and NFTs are the histopathologic hallmarks of AD. 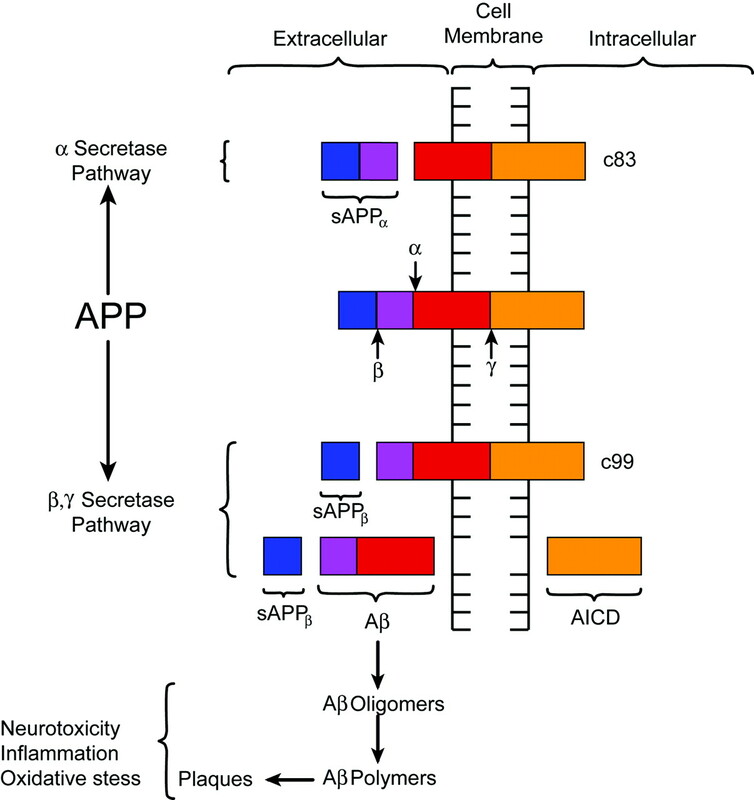 Plaques are predominately composed of Aβ peptide with frequently associated dystrophic neurites and inflammation. NFTs are intracellular inclusions comprising hyperphosphorylated τ protein that disrupts normal microtubular function. Although the precise pathogenesis of AD is unknown, the burden of these 2 inclusions tends to increase with advancing dementia. Alzheimer's original contribution to the neurosciences resides in his recognition of these 2 structures as pathologic manifestations of a neurodegenerative disorder, rather than the normal and expected culmination of aging. Supported by National Institute on Aging grants: P50 AG05681 and P01 AG03991. Accepted after revision June 27, 2007.